Photographer’s have a love/hate relationship with gear: we love how much fun it can be to try a new piece of equipment, and the surge of creative energy it can bring. But we hate how much money it all costs! In fact, spending too much money on gear is dangerous territory. It’s easy to get caught up in the cycle of buy, buy, buy, and wind up sending yourself into debt or frustration, or both. But you can’t avoid gear – you need it to create your images! So how to still get that gear, without breaking the bank? Here are 10 ways to approach gear purchases that will help you save money! Before you even begin to look at purchasing a piece of equipment, see if you can borrow it from a friend first. There’s a big difference between reading about how cool a certain lens is, and then actually trying it out for yourself to see whether it’s really the right gear for you. I once lusted after a very expensive lens for a long time. Finally I managed to borrow it from a friend, certain it would blow my mind. After shooting with it for a bit I was dumbstruck. It wasn’t actually that much better than what I already had, (in some ways it was actually worse!) and it would have cost me thousands of dollars. I wound up not making the purchase, and was very happy I borrowed first! Once you’ve given a piece of gear a good test in person you’ll be in a much better position to make the decision to actually spend your money on it. If this is a really big purchase, you might want to set up a test shoot for yourself, to really put it through it’s paces. If you don’t know someone to borrow from, you can also rent gear from many places. Check your local camera shops, or an online renter like LensRentals US or LensRentals Canada. One benefit here is that you have a lot more variety to choose from, and can rent for a long periods of time to really get a good feel for the equipment. The downside – renting gear costs money. Borrowing can be free (save for a thank you treat for your friend, of course!). For bigger pieces of equipment it can be hundreds of dollars to rent, so consider this carefully. Renting is good for more than just testing out a potential purchase. If you have a shoot planned that requires a certain piece of equipment that you wouldn’t normally use, this can be a more cost effective way to get it than actually purchasing. If you find yourself needing it often, then you can start to think about purchasing, but for occasional uses, renting can help save a lot of cash. Some renters will let you put the cost of the rental towards the purchase of the equipment, so keep that in mind if you’re testing something out and then decide to purchase! When we first were getting started in photography we bought almost all of our equipment used. We saved hundreds of dollars, which was critical when we were just getting our business going, and had lots of costs to deal with. We first used the Fred Miranda Buy & Sell forums. It took a lot of time to get a good deal, and there was the inherent risk in buying from someone you didn’t know. We once purchased a backpack that got lost in the mail. Luckily the seller took the hit, but it could have easily gone the other way and we would have been out hundreds of dollars. These days if we’re looking to buy used we head to B&H Used, a very reputable site that gives you clear descriptions of the condition of the gear. You probably won’t find any crazy deals, as they have a good idea of how much the gear is worth, but the selection is huge. It’s also very easy to search through, and you get the benefit of buying with confidence (They offer a 30 day “no questions asked” return policy, and a 90-day warranty). With all the comfort and warranty peace of mind of stores like B&H, we don’t buy from classifieds anymore. However if you still prefer the slightly more adventurous approach of searching classifieds, make sure you get the opportunity to examine and test the gear before you agree to purchase anything. There are many pieces of camera equipment that you can buy off-brand with significant savings. The biggest would be camera lenses. 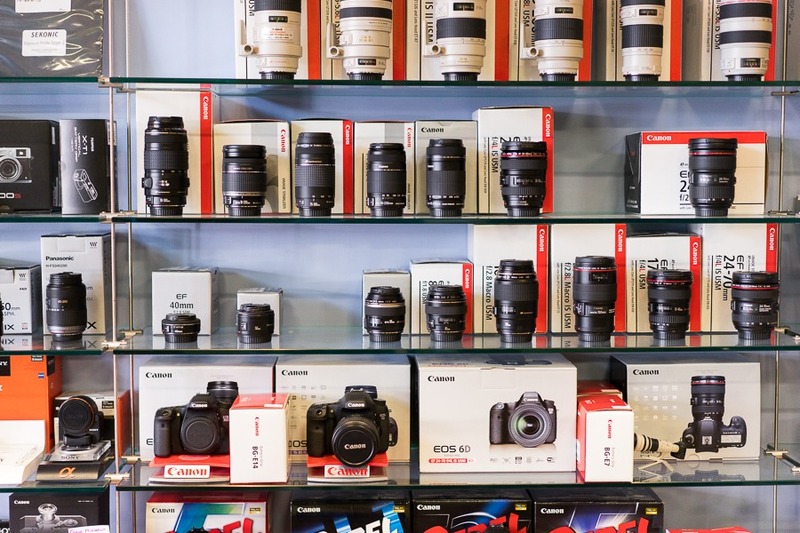 The main brands, Canon and Nikon, have lots of great lenses, but they can be quite pricey. Other manufacturers like Sigma, Tokina and Tamron don’t have the same brand presence, but they make a lot of top notch lenses for a lower price. Sigma is currently building a reputation for making better performing lenses than Canon or Nikon. Definitely worth checking out. A place where we frequently buy off-brand is camera batteries. The original batteries can be unbelievably pricey, especially when you need lots of extras if you shoot weddings or other high volume events. We’ve found that off-brand batteries are much cheaper, and while they may not hold their charge for quite a long, the savings make it worth it because we can buy multiple for the same price. For the record, one place we don’t buy off-brand is on memory cards. We stick with the main brands, SanDisk and Lexar, because in our experience the off-brands are more likely to error and fail. The savings are not worth losing your precious photos! Despite what we may tell ourselves, we don’t actually need the latest, greatest shiny new piece of gear. More often than not, last year’s model will do just fine, and you’ll save some cash at the same time. Especially if you time your purchase well, and wait for stores to start trying to clear out the old stock, often putting it on sale. And while we’re on the topic of sales, many companies frequently offer rebates which can sometimes save you hundreds of dollars, especially if you purchase a couple pieces of gear at the same time. Keep an eye out for these if you’re in the market for a new piece of equipment. A handy page to keep bookmarked is the B&H rebates search, or the B&H deals search, which can help you find great deals on whatever you’re looking for! Now when you’re checking for your deals, you may run across what’s commonly referred to as a “kit” or “bundle”. This is where a manufacturer puts together a bunch of items, with a claim of savings when you buy them together. Frequently these deals aren’t worth it. While it might seem like you save a lot, what usually happens is the manufacturer is adding in some low value, cheap quality accessories that you don’t really need, in order to make it look like a good option. You’ll likely end up with a much better quality setup if you choose your accessories yourself, and only get what you absolutely need. Also, kits often include a “kit lens”. These are mid range, low quality zooms that you’ll probably outgrow very quickly. Your money would probably be better spent on a lens you actually want that you’ll use for a while! If a kit or bundle is catching your eye, consider carefully whether you absolutely need everything inside, and check how much you’re actually saving by pricing it all out yourself. Don’t just take these at face value as being a good deal. This is a way to save money in the bigger scheme of things. You should always be taking stock of your gear, and asking yourself whether you’re actually making use of all of it. As you grow and change as a photographer, you’re likely to find that you stop using pieces of equipment, or something that you thought was essential ends up just collecting dust. The longer gear sits around unused, the more money you lose. Most camera gear loses value the older it gets (with lenses, especially good quality ones, being an exception). So if you’re not using something, sell it! You can sell your gear to B&H Used. We often sell our gear on Craigslist and get pretty good returns. Sometimes Rob gives himself a challenge: he can’t buy a new piece of gear until he makes enough money selling old, unused gear to pay for it. It’s a good motivator! I’m going to finish off with a couple of ways to approach thinking about gear that can save you money. The first is by adopting the idea that you don’t need a lot of gear to get started. 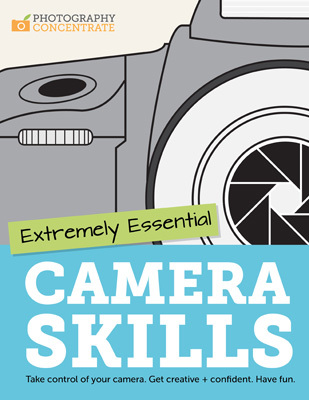 While it looks like a lot of fun to have the full range of lenses, the fanciest camera body, and all the accessories in the world, it’s not necessary to take great photos, and definitely not necessary to learn photography. In fact, starting really small, with an introductory camera body, and a cheap 50mm prime lens is a fantastic way to learn. It forces you to be creative, walk around to change your composition and really get to know a great focal length before moving on. Another way to approach buying new gear is to upgrade your equipment very slowly. Don’t think about buying a new lens until you’ve absolutely mastered the one you have, and pushed it as far as it will go. The same goes for your camera body. The more reluctant you are to upgrade, the more familiar you’ll be with your gear, and the more money you’ll have in your pocket. 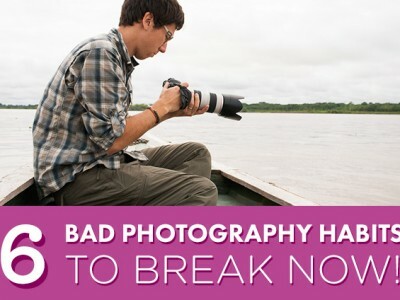 It’s a dangerous mindset to think that you need something new to take great shots. The vast majority of the time you don’t. You can do amazing things with even the simplest equipment, and a good dash of creativity. Then, when you’re positive that you’re ready to upgrade, use all the other tips in this list (borrowing, renting, buying used, hunting for deals) to help you make the most of your money when you do make that purchase! There’s nothing wrong with buying new camera equipment. In fact, it’s a really fun part of being a photographer – getting that box in the mail and opening it up, full of potential. Holding that new camera, or testing out that new lens is definitely a thrill. But it alone doesn’t make a great photo. You make a great photo, as the photographer calling the shots. Remember that gear is just one small piece of the equation. Developing a healthy relationship and attitude towards spending money on gear will take you a long way in your pursuit of great images. Do you have any tips for how you save money when it comes to buying new gear? Share them in the comments below! Need a hand figuring out what kind of camera to buy, which accessories are really essential, or what lens might be right for you? 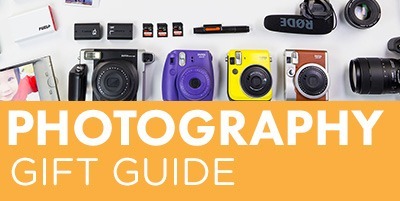 Check out our epic free Camera Buying Guide – it’ll get you up to speed so you can make your purchase with confidence! Great post! I also check photoprice.ca to compare. My local photoshop also offer price match. I send a quote and they send my an email if they can match the price. So I buy locally, save money and get great Customer service! Hi Lauren I’m currently using a Cannon 1300d with a Tamron 18 x 200 lens been taking pictures for about 9 months really happy with set up can you give me any tips & tricks to get the best out of it. Rick. I have to second KEH – we buy all of our bodies and lenses there. We have a school portrait business and we’ve been using Canon 30d’s and they’ve been workhorses. I almost always buy from Adorama’s used department or wait till Black Friday rolls around in the U.S. and then go deal and rebate shopping to get the best bang for my buck when it comes to lenses. I’ve found eBay to be a pretty good source to but as always it’s “buyer beware” if you don’t do your due diligence. As for off brands I’m having a lot of success with Tamron’s latest SP line plus saving a few thousand in extra cash is hard to complain about! Thanks for the tips Adam, I didn’t know Adorama has a used department too. Good to know! And another good tip on waiting for Black Friday, there are definitely tons of good deals to be had there! Glad to hear you’re having success with the Tamron line! It’s been a while since we tried one out, so it’s great to hear good things about it. Often people don’t think to rent or borrow equipment. Buying old can also save a lot of money when you’re starting out. I totally agree, Ralph! 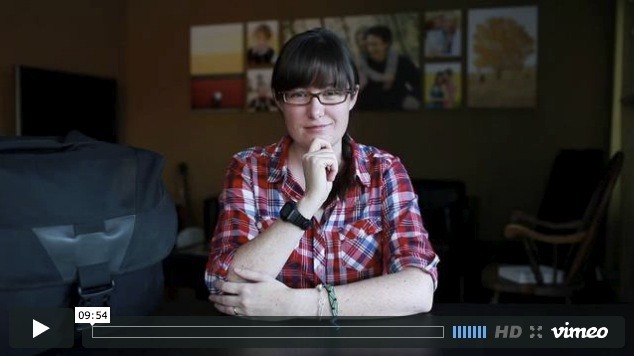 We saved hundreds (if not thousands) when we were getting started by buying secondhand! As for lenses, I use a Tamron 24-70 2.8 VC, Tamrom 70-200 2.8 VC and Tamron 90mm Macros, all SP lenses. 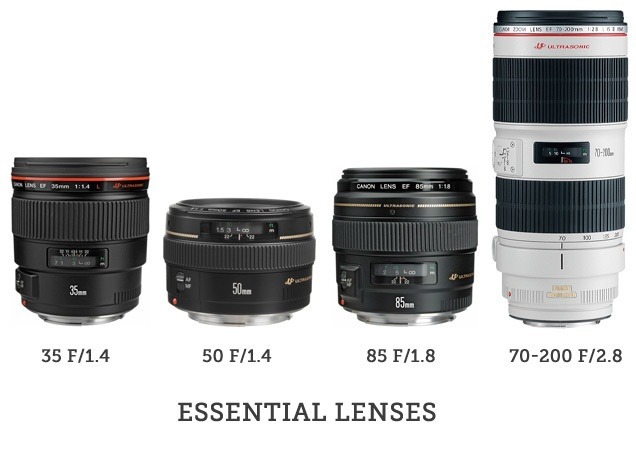 The 24-70 and 70-200 are built like tanks, weather proofed and have great image quality. The 90mm Macros is quite plasticy, but the image quality are amazing and the price is amazingly low. As much as I’d love to buy all the genuine Nikon lenses, they are just far too expensive, with a few exceptions. The 35mm 1.8 G or 50mm 1.8 G or D are fantastic and good value. Another area where 3rd party gear is much cheaper is flashes and radio triggers. I have a number of manual Yongnuo flashes which are great, considering the price. Where I live (In NZ) I find that some Hong Kong shops are cheaper than local 2nd hand gear. However, one flash I had to return because it broke took 3 months to come back to me. There are disadvantage with grey imports. Mrs. Lim, I have gotten my newer gear or refurbished off the internet and it is awesome. I have never had anything went wrong with it at all. That is a great thing. I am looking to add to my Nikon D3200 outfit with some prime lenses myself, Mrs. Lim. Please put more blogs like these because I am so interested in getting more lenses with my Nikon, Mrs. Lim. By the way, would it be okay with you if I call you Mrs. Lim instead of Lauren from here on out? I would greatly appreciate it a lot, Mrs. Lim. I didn’t own a kit lens for many years, not based on bad experience, but because I followed articles/opinions similar to yours. When we upgraded my wife’s camera a few months ago, a 18-55 VR Nikon kit lens came with her D7100. I bought the bundle with the intention to re-sell the kit lens. I was surprised to find image quality to be very good, no complaints there. The 18-55 is small and light weight, similar to a 35mm prime lens. The D7100 and kit lens make a great “walk around” combo. Again, I’m talking Nikon here. Maybe someone else can comment on Canon kit lenses? Can I ask, when did you use a kit lens last? IMHO, a kit lens is perfect for a photography starter. And that’s who you intended this articles for, right? I’ve also had good luck with KEH, Craigslist, and eBay over the years. Although with their massive growth have had more issues with eBay and Craigslist in recent years. So need to tread very lightly was those now. Another new one I keep hearing about about but haven’t yet tried is Greentoe, a reverse auction site. The lens I usemost frequently,… 98% of the time,..and one of my sharpest,..is a used one,…cost me just $85.00. The majority of my portfolio work has been taken with this lens,…its just a simple 70-210mm that delivers constantly tack sharp images. KEH out of Atlanta, Ga is another good source. Another site to check out is,… http://www.uglyhedgehog.com/ where many photographers sell gear within this small network of photographers,..great deals can be had there. Get really familiar with each of your current lenses,..use, use, use them often……can improve your image making with the gear you already have rather than adding more equipment to carry around. If you know other photographers,…maybe trading gear could work for both of you with no $$ involved. Newbie here. Awesome resource, Lauren! All links have been bookmarked! Thanks. Cool! Thank you for the recommendation! Great post. 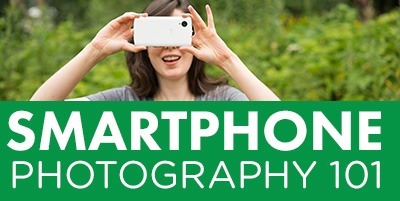 Photography can be quite an expensive hobby. It can, but it’s almost about being strategic on what you’re investing in!